Yippee! We won ‘Commended’ in Best New Film Society national award ceremony by BFFS at British Film Institute on the South Bank yesterday! A HUGE ‘thank you’ to all the teachers, parents, LPSB sixth formers, friends and local residents who have helped FILMBOX to be so successful, so quickly in our first year – this national award is for YOU! And we’re not even 1 year old yet… Join us for our 3-day 1st Birthday film festival THIS Thursday to Saturday 26-28 September 2013. If you haven’t seen a film at FILMBOX yet… why not? FREE parking, no popcorn mess, scrumptious local Simply ice cream, friendly faces, a cafe/bar and GREAT films – seeing a film with an audience is the VERY BEST way to see a film and have a memorable experience and FILMBOX is for EVERYONE in the local area. 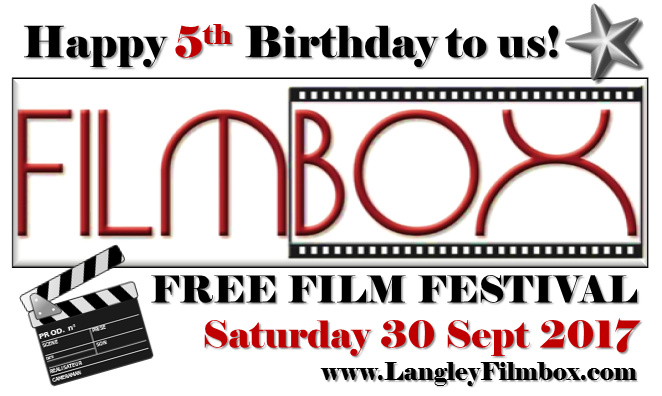 We are celebrating our 1st Birthday with a FREE FILM FESTIVAL open to all on Sat 28 & Sun 29 September 2013 based at Langley Park Centre for the Performing Arts in Beckenham. For a donation (suggested £25) your business/local group can be featured as one of our fab festival sponsors, both in our social media and in the festival programme. We are showing FIVE FREE FILMS across the weekend and we expect to attract a total of over 600 LOCAL PEOPLE for the films – FILMBOX patrons are typically aged between 20 to 60+. We are also happy to distribute your promotional literature, balloons or whatever you like during the weekend itself. Please remember that we are a not-for-profit venture and are fully self-funding and your donations will help to ensure the continuance of FILMBOX as an exciting new local arts venue for the London Borough of Bromley and surrounding areas – we are FORTNIGHTLY (except for school holidays) from this September. Our surplus profits go to local and national chariities. You can see the festival programme we have planned here https://langleyfilmbox.wordpress.com/coming-soon/ and can email Vivienne to discuss your requirements at LangleyFilmbox@gmail.com. ‘Untouchable’ played beautifully last night – an ice cool cinema and lots of happy smiling faces and laughs at this superb film – if you missed it, do try to see it soon. We are busy planning our new Autumn season – do take a look at the films coming up and save the dates – make sure you subscribe to this website to get regular updates of when films go on sale. Friday 30 August 2013 – ‘The Great Gatsby’ (1974 Robert Redford version) – 6.30pm for 7.45pm – a special ‘Members Only’ event for the new members of FILMBOX. Black tie and glamour. Film is FREE but £5 ticket for 1 glass of fizz/non-alcoholic alternative and canapes. Join by 20 August 2013 to qualify for an invite (just so we can cater for numbers etc.). 16+ only. For full details of our new membership scheme please see above page on this site. Wednesday 11 September – the current release ‘Robot & Frank’ (in Studio 609, 6.40pm for 7.30pm). £7/4. 16+ only. Thursday 26 September – our 1st Birthday – Hitchcock’s magnificent ‘Vertigo’ (on the BIG screen in the Bromley Hall, 6.30pm for 7.30pm). £8/5. Under 16s welcome. 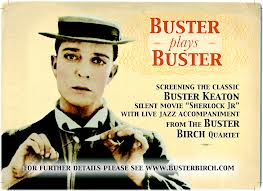 You can book ‘Buster Plays Buster’ NOW at www.TicketSource.co.uk/lpcpa (arranged by LPCPA not FILMBOX hence different booking website) on Friday 27 September 7.30pm (refreshments from 6.40pm). Allocated seating in the magnificent Bromley Hall (in Beckenham!) – £10/£6. Live jazz accompaniment by international jazz musician (and old boy of LPSB!) Buster Birch to Buster Keaton’s 1924 silent masterpiecve, ‘Sherlock Junior’. Under 16s welcome. Saturday 28 September – FREE film festival! THREE films (one OUTDOOR!) and bar-b-ques… films tbc. Sunday 29 September – FREE matinee… film tbc. Hope to see you very soon… have a great Summer!